December 13, 2015. I bet most of you have heard of St. Lucia’s Day, or at least know the song Santa Lucia. And I’m sure everyone is familiar with some of the holiday’s customs, which include having the oldest daughter — who’s crowned by a wreath of candles and dressed in a white gown — serve breakfast to the family. If you’ve lived in Minnesota, Wisconsin, Washington, or the Dakotas, chances are you’ve even seen a Santa Lucia procession or two, since these states are heavily populated by Scandinavians. I’ve never witnessed the real thing, however, so attending a Santa Lucia celebration firsthand was one of my goals when we moved to Norway. I had lots of questions about the event, but probably the biggest was wondering why Scandinavians sing about an Italian saint. So I did a little research into her history, including her immigration to Northern Europe. The story goes like this. During the 3rd century, the Roman Emperor Diocletius got fed up with Christianity and other sects that refused to participate in certain public rituals he viewed as vital to a unified Empire. So he issued some hard-core edicts that resulted in what is known as the Diocletian Persecution. Young girls called Lussibruds (Lucy brides) don white dresses to symbolize Saint Lucia’s virginal state at the time of her death. The red sash represents her martyrdom. In Norway, it’s said that the saint was a young noblewoman who wore a crown of candles and lingonberry twigs while carrying baked goods from farm to farm before daybreak. Any non-compliant religion was viewed as a threat to the State, and its practitioners were imprisoned, tortured, and executed. As you might imagine, lots of minorities took to hiding, and a favorite spot was in the catacombs beneath Rome. This is where Santa Lucia comes in. To light her way through the dark burial crypts, she wore a crown of candles — which conveniently left her hands free to carry more food to her fellow Christians who cowered in the tunnels below the city. Nils Bergslien’s painting “Julereia” (1922) shows Lussi stealing a child while riding her broom. She leads a parade of trolls, gnomes, and the spirits of murderers, thieves, and general degenerates. By the way, the Norwegian word for “witch” is “hex” — yep, the term we’ve inherited in English to mean the spells cast by a witch. But this isn’t the only Lucy involved in St. Lucia Day. The pagan Scandinavians believed that on the Winter Solstice (which they observed on December 13th), a witch or she-demon by the name of Lussi rode through the skies on a broom, accompanied by an entourage of trolls, elves, and ghosts. Those peasants who’d done a crappy job of managing their farms could expect her to kill their cattle and claim their children. Since her favorite entry point for a kidnapping was the chimney (how’s that for a “Bad Santa?”), someone in the family was tasked to stay up all night to keep the hearth fires burning and the candles lit in every window — the surefire way to drive her away. Now comes the part where pagan and Christian legends marry. Early missionaries carried tales of Santa Lucia to Scandinavia, and as usual, converts merged the traditions of both their new and old cult figures. St. Lucia (whose name is based on Lux, the Latin word for “light”) seemed a tailor-made fit as the pagan Lussi’s stand-in. But rather than being seen as a harbinger of doom, she became the bringer of light on the longest night of the year, thus redeeming the holiday from the heathens. 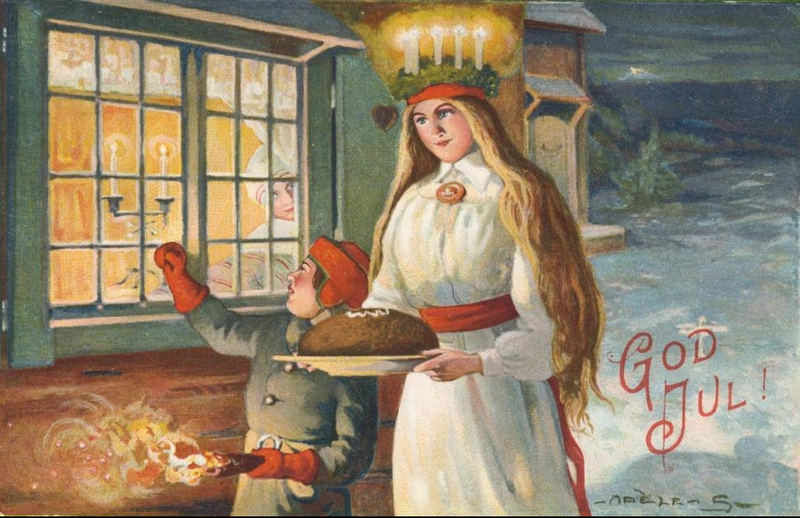 Scandinavians today still place lights and candles in windows, just like their ancestors did on Lussinata (Lucy’s Night). Guess our inner primal human will always have a fear of the dark. Lussi the she-demon didn’t disappear from the story entirely, however. 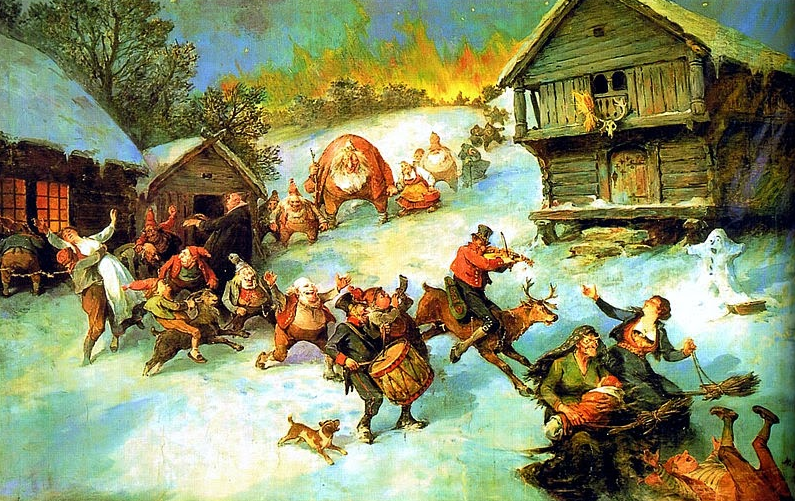 For centuries, Scandinavians believed that she commenced her late-night raids on December 12th (St. Lucia’s Vigil) and continued them up through Christmas Eve, until the light of Christmas morn banished her for another year. 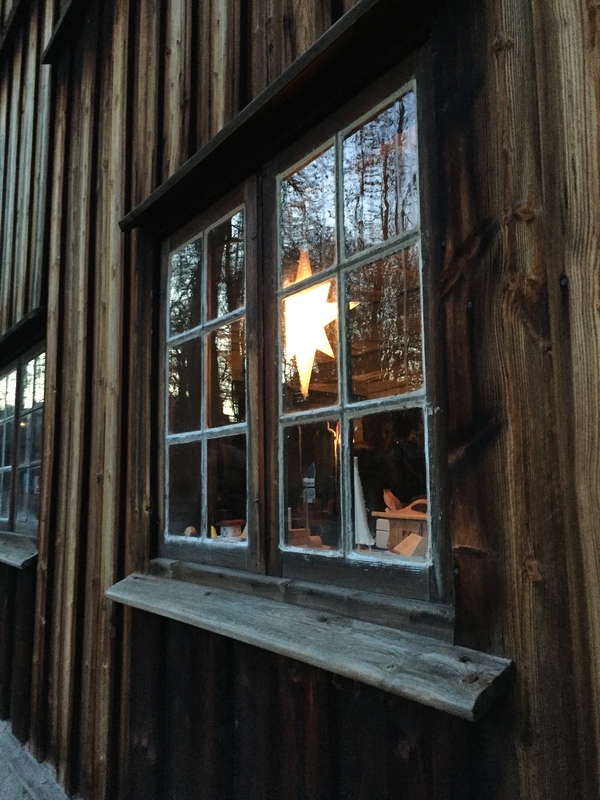 The modern Scandinavian custom of displaying white lights and candles during the holidays is a hangover from pagan practices designed to hold Lussi at bay long ago. 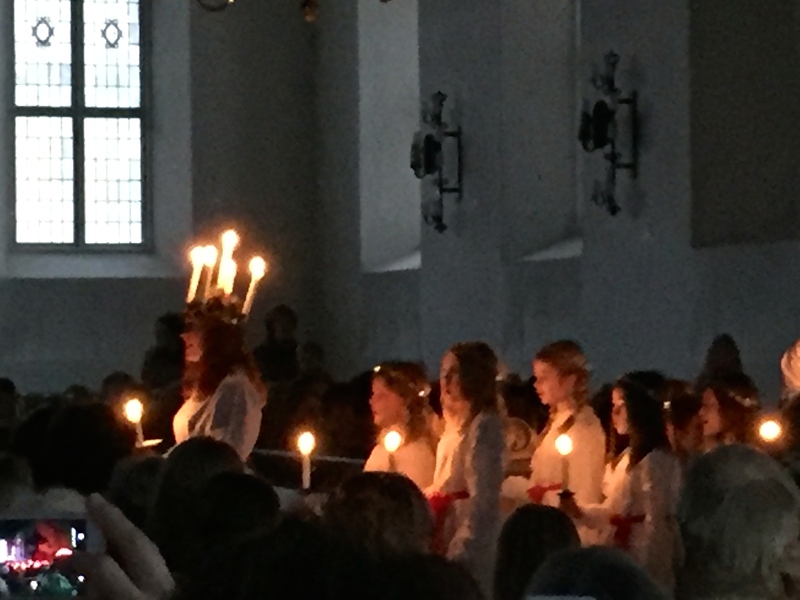 To observe St. Lucia’s Day this year, we’d purchased tickets to a Lucia concert featuring the University of Oslo’s Women’s Choir. The event began before daylight on December 13th and was held at the gorgeous Domkirke, Oslo’s Lutheran Cathedral. (It’s where members of the royal family get married.) 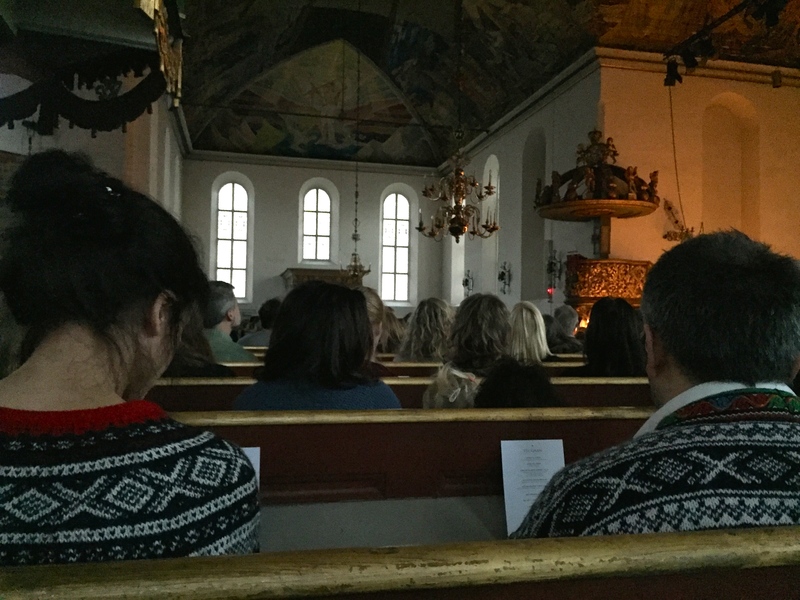 That dark morning, we filed in and seated ourselves amongst a sea of Norwegian sweaters and bunad (traditional costumes), feeling as if we stuck out like sore thumbs. Somehow we missed the memo that Norwegian sweaters were a requirement to attend the concert. Soon someone extinguished all the lights in the church and everyone grew quiet in anticipation of the saint’s arrival. Sure enough, the first strains of Santa Lucia drifted through the darkness and wound their way down the nave of the church. And yes, the choir sang the familiar Neapolitan tune, with a few tweaks. Santa “Lew-CHEE-ah” had become Sancta “Lew-SEE-ah.” And the Italian lyrics had been swapped out for Norwegian words detailing her role as a light-bearer on the darkest night of the year. One of my favorite songs was “Carol of the Bells,” which was given a special charm by the piping voices of the tiniest girls. The singing grew louder as the procession, led by St. Lucia in full regalia, neared the transept where we were seated. Behind her trailed young women and little girls, each crowned with holly, dressed in white, and carrying a single candle. Slowly they formed a circle underneath the gilded pulpit, and for the next hour, they serenaded us with a mixture of Jul folk tunes and more familiar holiday songs. But the beauty of the performance wasn’t only in the music or the words; it was in the fact that, as the sun began to rise and tinge the stained-glass windows with pink, the voices grew louder, mirroring the breaking of dawn. The sound wove through the crowd like the first tendrils of green creeping up through the snow … and I could easily see why Santa Lucia had become a symbol of hope and the promise of spring for a land locked in the dead of winter. The Domkirke is Oslo’s Lutheran Cathedral. It’s where members of the royal family attend church and royal weddings and funerals are held. Notice the candles out front, signifying that the church is open. Sunrise is just on the horizon. Much of the church interior is Baroque. The “sky box” on the left is where the royal family sits during services. The ceiling of the Domkirke is covered in modernist paintings by Hugo Louis Mohr. I love the prayer candles in Norwegian churches. They look a bit like armillary spheres. Note the smaller version for the kiddies to use. The gilded Baroque pulpit that the choir sang beneath dates to 1699. Three of the choir’s littlest members pose in a Kodak moment for their mom. I’m betting her black skullcap is flame retardant. Too bad it couldn’t protect her from the candle meltdown. Outside, the choir members served us coffee and saffron buns, which are another holdover from paganism. The color and the swirling shape represent the sun. The buns are sometimes called “lussekatter,” meaning “Lussi’s cats.” I suspect this refers to the pagan witch Lussi being represented by her familiar, a cat. Hence the two raisins in each bun, which are the cat’s eyes. The exterior of the bell tower holds another pagan remnant. Nicknamed “The Devil of Oslo,” it depicts Evil devouring Mankind using artistic themes found in pagan Viking art. It was taken from St. Hallvard’s Cathedral, an earlier Romanesque church (1100s) that was demolished and used to build the new Domkirke in 1697.